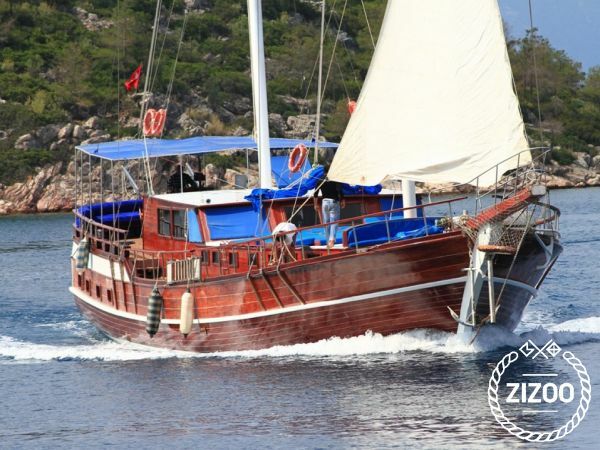 Gulet Nika 15 is a traditional ketch design gulet, based in Marmaris,Turkey. Nika 15 is 27 metres in length and can accommodate up to 16 guests with her comfortable 8 cabins. She can sleep up to 16 guests comfortably on board, in 8 double cabins. There is a salon with seating area, bar, TV, music system and internet access. On the aft deck there is an al fresco dining area and cushioned seating area, that is shaded for your comfort. The fore deck offers sunbed cushions for you to enjoy the sun, whilst cruising. Nika 15 gulet is a perfect choice for larger groups of friends and family, offering really great value for money.